The Devil Makes Three are back with a bang. ‘Chains are Broken’ is their first album of original material in five years and it’s certainly worth waiting for with 11 strong tracks and thankfully no banal album fillers to simply make up the numbers. 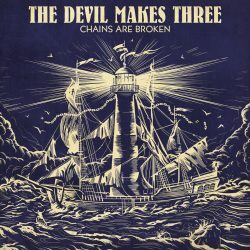 As an acoustic trio consisting of two guitarists (Pete Bernhard and Cooper McBean) and a string bassist (Lucia Turino), the Devil Makes Three are a somewhat unusual alt-country band. While deeply rooted in the blues and country music, they unashamedly incorporate elements of bluegrass and ragtime into their eclectic musical mix. On ‘Chains are Broken’, the usual cast of three, is boosted by the addition of drummer Stefan Amidon, who imbues the whole album with a wonderful feeling of pace and grit, creating a much rockier feel than the bluegrass/ragtime/jug band sounds found on their 2013 effort ‘I’m a Stranger Here’ and certainly very different from their somewhat unexpected album of song covers from 2016, ‘Redemption and Ruin’. This contrast in style is evident on ‘Paint my Face’, the first track released from the album. With Amidon’s drumming anchoring the track, it allows Bernhard and McBean’s guitars to create a gorgeous flowing melody that makes it very difficult to resist singing along (despite the somewhat unusual messages about reincarnation in the lyrics). Ted Hutt (Gaslight Anthem, Flogging Molly) has done a great job with the production and there is some really good music on this album as he seems to have forced the band out of their comfort zone and the results are impressive. This is emotionally raw music and the punchy, rhythmic nature of the 11 strong tracks makes for a fine piece of work. All in all, an excellent record that will continue the positive critical acclaim for The Devil Makes Three. Previous Previous post: Lost Kinks track found!